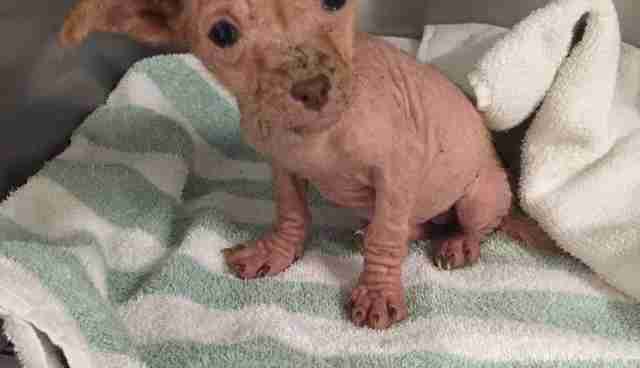 This small pup's start in life has been devastating - but it's starting to pick up for the better. 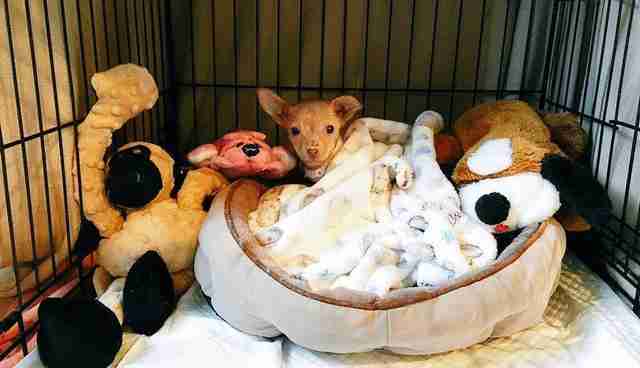 At just 3.5 pounds and about two-and-a-half months old, Poptart was found at a McDonald's in northern California in a crate near the dumpsters. 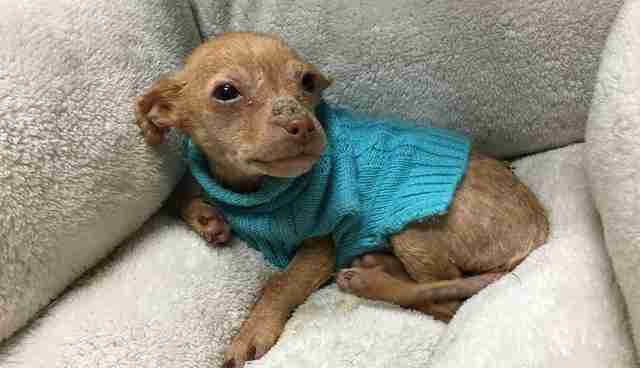 One morning early last month, a couple had stopped by McDonald's to grab breakfast when they came across Poptart, lying next to a puppy assumed to be her dead sibling, Sarah Varanini, foster care coordinator at the Sacramento Society for the Prevention of Cruelty to Animals (SSPCA), told The Dodo. 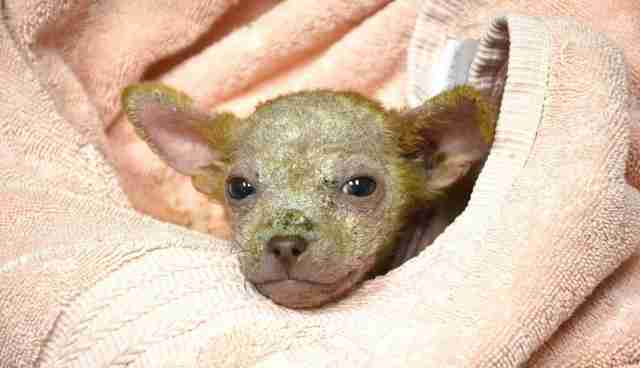 Both Poptart and her sibling, thought to be Chihuahuas, were bald from demodectic mange, a skin disease caused by mites. 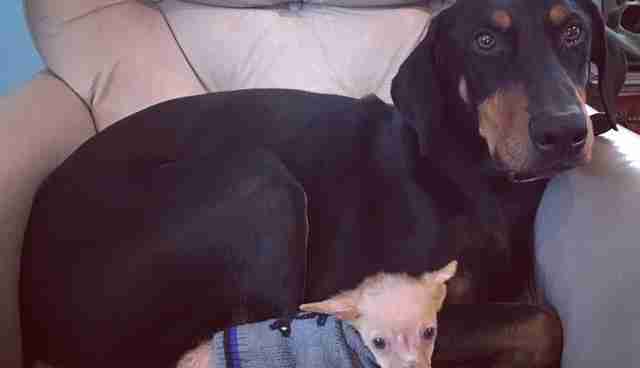 "It's been getting down into the 30s and below so we're assuming that her sibling probably passed away due to the temperature," Varanini said. Somehow, Poptart was able to make it through the night. The couple brought Poptart to the SSPCA that morning, and she was immediately put into foster care. 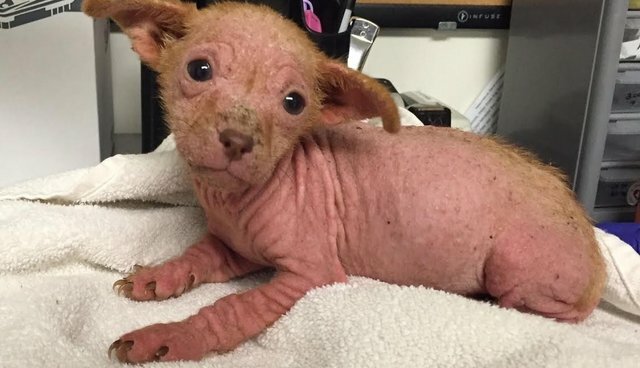 Even though Poptart was abandoned, hairless and just a baby, Varanini says she's been nothing but a delight with the SSPCA staff. She was happy, friendly and even "danced around." "It's one of those things where you don't know what their life was like before they came here," Varanini said. "But she's still very trusting of people and immediately just loved everybody at the shelter. 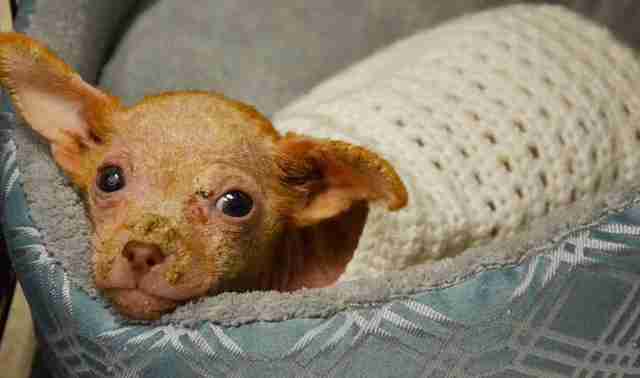 So she's still a sweet, happy little girl despite having a pretty rough start." Poptart is now doing well and is being for treated her skin condition in foster care, where she's been for about a month now. Varanini says that once she grows a good coat on her body, within another month she should be ready for adoption into a loving home and family. For information on how you can adopt a shelter animal, check out Adopt-a-Pet.com to get started.